It appears the French are hot on the trot of the eco revolution as they enforce yet another earth friendly tax. France will soon place a tax on all throwaway plates and cutlery that are not recyclable in order to encourage consumers to choose greener alternatives and buy more eco-friendly products. The tax that consumers pay will apply to non-recyclable cardboard. For plastic tableware the costs will be levied on distributors and importers. The environmental minister of France has said that a similar tax may soon be added to electronics and household accessories such as fridges, washing machines, televisions, batteries and wooden furniture; though this has not yet been confirmed. Fingers crossed it will be passed - it's regulations like these that create the, if you like, forced incentive for designers, manufacturers and consumers to create and choose the most eco-friendly products. France has already imposed a tax on the most heavily polluting cars. Under the new ‘bonus-malus' system the greenest vehicles get a tax break. 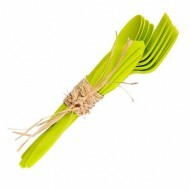 Be it in the French countryside or the English the next time I go for a picnic I know I'll be packing the silverware!